The ICRISAT global headquarters is located in Patancheru near Hyderabad, Telangana, India. The research station offers an insight into the integration of agricultural sciences and research-for- development activities across the whole value chain – high end science using germplasm from the genebank, genomics laboratory, phenotyping and genetic engineering facilities, through to the agribusiness center, watershed management and crop production field experiments. 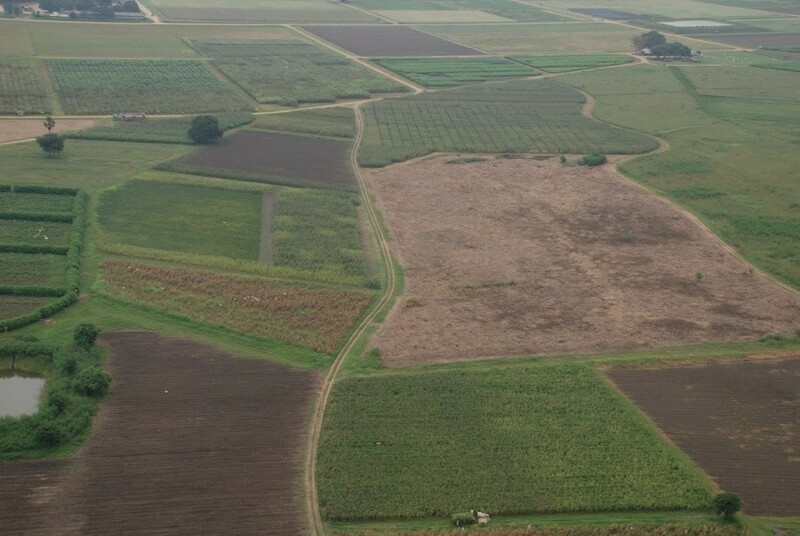 The research station has a land area of 1,390 ha, of which 800 ha is arable. The experimental farm is representative of the dryland environment – consisting of two major soil groups found in the semi- arid tropics, the red alfisols (300 ha) and the black vertisols (500 ha) – that allows testing of breeding lines and crop production systems in two different environments within one location. The arable areas in the two soil types are subdivided into irrigated and non-irrigated, sprayed and non-sprayed, and low and high fertility areas to represent low and high input environments. Normal rainfall at the ICRISAT campus is 800 mm per year. The rainout shelter is a facility for screening of crop germplasm and breeding materials for drought tolerance so that rains do not interfere with the treatments. Crops can be grown here under real field conditions, and drought condition can be created for research work on drought-tolerant traits and how roots help dryland crops survive during dry periods within cropping seasons. The Rainout Shelter has a lysimeter facility for phenotyping. Lysimeters are PVC tubes filled with soil to measure plant water use. ICRISAT’s lysimetric facility has 2800 tubes of 1.2-m length and 20-cm diameter, and 1700 tubes with 2.0-m length and 25-cm diameter. These dimensions give the plants the soil depth and aerial spacing similar to field conditions. Lysimeters complement other phenotyping activities both in the field and in controlled environments. The lysimeter approach provides a bridge between field-based and laboratory-based research. It enables the collection of precise data on water consumption (quantities, timing) which are related to agronomic data (grain yield), and which provide information on traits that contribute to yield increase. LeasyScan is a high-throughput phenotyping platform acquired in 2014 designed to measure leaf area quicker so as to access the dynamics of leaf development and leaf conductance, traits that are the focus for plant drought adaptation. The high throughput computerized platform based on 3-D images allows scientists to analyze the phenotypes of plants in greater detail, and conduct large-scale screening of plants to be linked and integrated into genomics and breeding works to speed up the development of improved, drought-adapted crops. The LeasyScan platform uses the PlantEye® scanner, a camera with a 45 degree angle that captures 3-D images. The high-throughput scanning equipment can scan between 3200 to 4800 plots per 2 hours. Several algorithms then operate to extract leaf area, leaf angle, plant height, and average leaf area. The scanners measure pre-set areas (called sectors) of 65 cm width and either 40 cm or 60 cm length. A grid of barcodes throughout the platform allows re-setting scanner position in y and z directions. Eight scanners are mounted on top of an irrigation boom. Their movements at a constant speed and space above the pots have been two of the key considerations during the design of the platform. The Ascochyta blight (AB) and Botrytis grey mold (BGM) phenotyping facility at ICRISAT allows scientists to analyze phenotypes for chickpea cultivars against these economically important diseases in great detail. The high-throughput automated phenotyping platform based on temperature, humidity and photoperiod control also enables large-scale screening of plants to be linked and integrated into the chickpea breeding program to speed up the development of improved disease-resistant crops. The controlled-environment, plant growth room has been optimized for AB development with the help of air-conditioning (temperature), humidifiers (humidity) and fluorescent tubes (photoperiod). A timer automatically controls the lighting system. 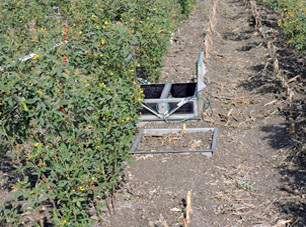 This unique facility allows comprehensive and convenient screening of chickpea crops against AB and BGM, independent of crop season and time. The Center of Excellence in Genomics’ (CEG) breeding and research facility caters to the molecular breeding needs particularly of developing countries through its three main activities: (1) applied genomics research and sequencing, (2) high quality marker genotyping services and capacity building in modern genomics, and (3) molecular breeding tools. It provides genotyping services on cost-to-cost basis to all its partners, such as SSR, DArT and SNP genotyping platforms; and MiSeq-based next generation sequencing. These services are offered for all crops and from clients coming from the NARS, private sector and research community across the globe. Recently, CEG acquired the Illumina HiSeq 2500 – the world’s most powerful sequencer – to analyze, store and share huge sequence data and make full utilization of modern genomics tools in breeding and research programs at ICRISAT and in other partner institutes in developing countries of Asia and sub-Saharan Africa. It is a high performance computational genome analysis (HP CGA) facility with two servers, each having 80 cores (total 160 cores), running on 1,000 Gb and 500 Gb RAM, respectively, with a total storage capacity of 100 Tb. The Center of Excellence on Climate Change for Plant Protection (CoE-CCRPP) strives to understand the effect of climate change variables on the occurrence and distribution of diseases and insect pests in chickpea and pigeonpea across geographical regions, study host x pathogen/pest x environment interactions and the resistance to pests and pathogens in resistant and susceptible cultivars. The key climate change variables considered are: (1) higher temperatures; (2) moisture extremes – drought and flooding; and (3) elevated carbon dioxide. Specially created facilities such as open top chambers (OTC) and Free Air CO2 Enrichment (FACE) are aiding the study of the effects of elevated CO2 levels on diseases and insect pests of chickpea and pigeonpea. The ihub at ICRISAT is a creative space where agricultural tech entrepreneurs, scientists and technology.experts can collaborate to innovate cutting edge ideas across the whole agriculture value chain to benefit smallholder farmers.Spread over 10,000 sq. 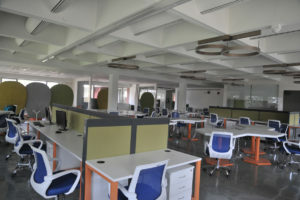 ft, it is a fully furnished area that includes a 40-seater accelerator facility. 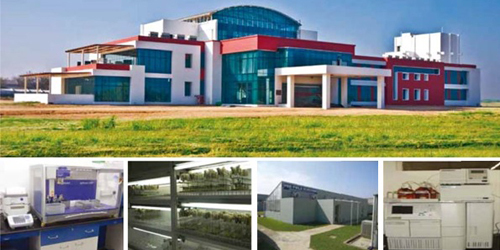 The insect rearing and bioassay facility helps research in entomology, crop improvement and biotechnology at ICRISAT. 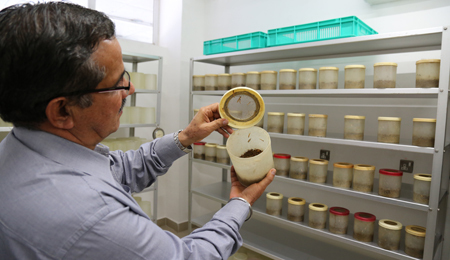 It provides nuclear insect cultures to national scientists. The constant availability of insect cultures helps in conducting insect bioassays in toxicology and to evaluate transgenic plants, map populations, germplasm and segregate breeding materials for insects throughout the year. Artificial diets have been developed to constantly rear some of the most damaging insects in grain legumes – the legume pod borer (Helicoverpa armigera), beet armyworm (Spodoptera exigua) and tobacco leaf caterpillar (Spodoptera litura); and in cere als, the spotted stem borer (Chilo partellus) and the oriental armyworm (Mythimna separate). ICRISAT has a diverse collection of identified insect pests of its mandate crops and their natural enemies, in addition to insect fauna in/around the campus, which serves as a valuable reference collection. A digitized library and a DNA barcoding of all the insect specimens in an insect museum are in the planning stage. The Platform for Translational Research on Transgenic Crops (PTTC) was established to facilitate a collaborative and coordinated approach for the translation of existing genetic engineering technologies to the development of transgenic crop varieties, which can efficiently be taken through product development to commercialization. PTTC provides complete pipeline solutions for effective development of transgenic products and their delivery. It also serves as a facility of reference to strengthen national, regional and international linkages and collaborations in transgenic research and development, exchange of materials and information, and to support training, consultation and technology commercialization. 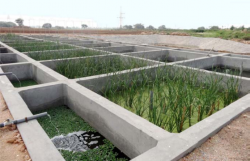 The wastewater treatment system constructed at the ICRISAT campus comprises a solar power- operated water pump to lift the wastewater, an elevated tank to hold the untreated wastewater, constructed wetlands, and a storage tank to store treated wastewater. Field trials are planned with the objective of assessing the impact of wastewater reuse for irrigation on crop yield, quality, and soil health. Low cost, simple technology and minimal maintenance are some of t he features of this system. It is also being developed as a business model for rural areas. There are 15 glasshouses/poly houses and net houses at the ICRISAT headquarters. Pot experiments are conducted in the greenhouses under controlled temperature, humidity and light conditions. Some of the glasshouses are especially designed for biotechnology work. A unique system that has been adopted at the station is the collection of rainwater from the roof of glass/ green houses. From a 5000 square meter roof, pure rainwater is collected and stored in two underground tanks (2 million liters of rainwater). This is very low in salt content (10-20 ppm) as compared to that of bore well water (up to 450 ppm salt). Rainwater is deionized and used in laboratories and glass houses for experiments. This system of rainwater conservation saves the institute about USD 1100 a month. 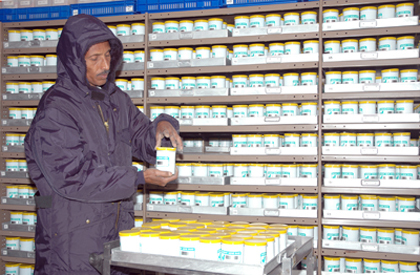 The ICRISAT Genebank serves as a world repository for the collection of germplasm of the institute’s six mandate crops – sorghum, pearl millet, chickpea, pigeonpea, groundnut, finger millet; and five small millets – foxtail millet, little millet, kodo millet, proso millet and barnyard millet. With over 121,500 germplasm accessions assembled from 144 countries, it is one of the largest international genebanks. Several landraces now conserved at the ICRISAT genebank have disappeared from their natural habitats in Africa and Asia. The collection serves as insurance against genetic erosion and as a source of resistance to diseases and pests, tolerance to climatic and other environmental stresses and improved quality and yield traits for crop improvement. The active collection of the genebank, stored at 4°C and 30% RH, is a basic source for distribution and utilization. The base collection is maintained at -20°C in vacuum packed aluminum foil pouches at 3-7% seed moisture content. Base collections ensure long-term viability of material (more than 50 years) as a security to the active collection. In addition, ICRISAT has committed to place the FAO- designated germplasm (111,000 accessions) at the Svalbard Global Seed Vault in Norway as safety backup. The Seed Vault provides an insurance against the loss of seeds in genebanks, as well as a refuge for seeds in the case of large-scale regional or global crisis. Movement of seeds across countries is regulated as per Government of India (GoI) regulations. All research seeds imported by the institute or sent to other countries, are tested in the Plant Quarantine Laboratory, and cleared and certified by GoI officials. In the past 40 years, through the meticulous work in this laboratory, all samples coming in and out of the country have been cleared. ICRISAT maintains a huge collection of wild species of groundnut (Arachis hypogaea). These are important for the improvement of cultivated groundnuts. Many of these species do not flower or produce seeds in normal crop growing seasons in India, and have to be grown in this special facility. The watershed area is where strategic research on rainwater harvesting, conservation management as well as soil conservation and crop production is undertaken. This area is maintained without much movement of soil or changing the natural slopes. This area has black soil watersheds. Watershed-based crop production is a simple technology that makes it possible to grow two crops under rainfed conditions using suitable land and water management. This technology can produce 5 tons of crops per ha/year, which can feed 24 persons per ha/year, much higher compared with farmers’ practice which produces 1 ton/ha/year and can feed only 5 persons. This work is now being up-scaled in different locations. Information on weather and climate is very important for agriculture. This met lab is a class “A” type, which is fully equipped to record all required weather parameters such as rainfall, temperature, soil temperature, humidity, sunshine hours and radiation, etc. essential for agricultural research. Some of the equipment are manually operated, while others are automatic devices. This weather data system is attached to the institute’s computer network system and all data are available daily for researchers globally. Greenhouse gas (GHG) emissions (CO2, N2O, CH4) can be quantified from a range of cropping systems (dryland cereal-legume-fallow, rice-postrainy cereal/legume/oilseed-fallow etc,) under semi-arid tropical conditions using an automated chamber sampling system. 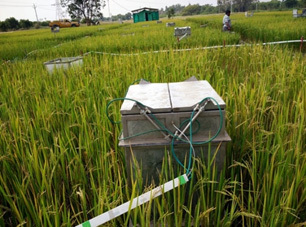 Sampling chambers located in the experiment measure the highly dynamic GHG emissions eight times per day in response to environmental conditions and management of the cropping system. The in situ gas sampling unit normally remains open and closes when measurements of GHGs are made (see images on the right). A controller unit and gas chromatograph adjacent to the trial provides fully automated sampling and measurement. ICRISAT’s Agribusiness and Innovation Platform (AIP) fosters public-private partnerships to bring science-based technologies, innovations, knowledge and products to the market for the benefit of smallholder farmers. AIP provides prototype innovation, knowledge and expertise, training and co- location to researchers and innovators; and guide entrepreneurs in fine-tuning the prototypes and taking them to market to minimize risk and help them succeed. – Product development of nutritional foods and food safety initiatives (NutriPlus Knowledge program). This pilot facility at ICRISAT’s Agribusiness and Innovation Platform (AIP) scales-up product prototypes based on its mandate crops (sorghum, millets including small millets, peanut and pulses) including Energy and Nutrient Dense Foods (ENDFs) being formulated at the NutriPlus Knowledge (NPK) laboratory. It facilitates prototyping and pilot-scale production of value-added food products and also supports entrepreneurship development and capacity building for entrepreneurs. Processing sorghum and millets (including minor millets): The facility is equipped for sorting, dehulling, grading and destoning of grains, roasting of whole and dehulled grains; pulverizing cleaned whole/dehulled (unroasted or roasted) grains into fine or coarse (semolina) flour, mixing different ingredients with millet flours to prepare ready-to-cook and ready-to-eat energy and nutrient-dense food products. Processing and packaging peanut and sorghum/millet/pulse-based ENDF: The facility has a deskinner, splitter, roaster, table-top mixer-blender to prepare the ENDF by incorporation malted and roasted millet flours, pulses and other ingredients, including vitamin and mineral pre-mixes. It also has a semi-automatic cup sealing machine to hygienically pack the ENDF into sealed cups. Processing sorghum/millets/pulses-based baked ENDF: The facility has equipment for prototyping of baked ENDFs including cookies, biscuits, etc. The Center of Excellence (COE) in Information and Communications Technology (ICT) innovations for Agriculture was launched in 2012 to integrate science, technology and value-chain approaches in the design and development of new and affordable ICT tools, platforms and methods. KSIConnect (http://ksiconnect.icrisat.org/) – shares information and educational video resources, face- to-face virtual training and learning sessions, and virtual expert-farmer interactions globally. 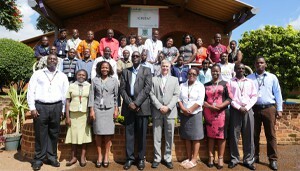 AgED Open Courseware platform (http://www.aged.icrisat.org/moodle23/) – offers research curriculum/learning opportunities to students, faculty members, extension agents, smallholder farmers etc. 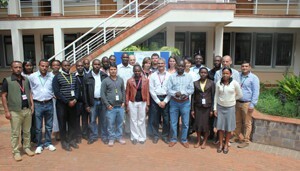 Open Access Repository (http://oar.icrisat.org) – hold more than 8,163 publication records. 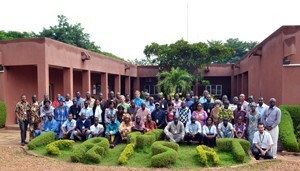 Open Data Repositories (http://dataverse.icrisat.org) – offers open data to global community (464 data files in more than 9 Dataverse with 59 studies available). GIS tools help researchers decipher patterns, relationships, and trends across locations. When fused with remote sensing and modelling, the result is a jolt of power to research, especially natural resource management. ICRISAT’s current expertise lies in crop modelling, hydrological and landscape modelling, bio-economic modelling, foresight modelling, trade-off analysis, and spatial analysis. It plans to include in the future expertise on crop modelling for trait selection, biotic dynamics and interactions and grassland/forage/animal/biodiversity/environment interactions. The state-of-the-art Charles Renard analytical Laboratory analyses soil, plant and water samples. It diagnoses soil fertility constraints and assesses water and plant quality from farmers’ fields in the semi-arid tropics. The laboratory is equipped with automated instruments such as the ICP-OES, AAS, and SKALAR auto-analysers that provide analytical services to ICRISAT and its partners. The Biometrics unit assists in planning statistically sound and cost-effective research designs; facilitates appropriate statistical analysis, data cleaning, data management, valid inferences and presentation of the results; provides standard elementary and advanced statistical analysis and training for statistical software; develops new and appropriate statistical methods and use of bio-computing programs for specific complex data analysis; offers specialized on/off site training courses and workshops on refined use of statistical methods and related statistical software; and offers students and in-service candidates opportunities to work on practical biometric and bio-computing problems of mutual interest. The Institute conducts face-to-face hands on specialized skill and training courses on new cutting-edge technologies, research methodologies, or other emerging topics from time to time. By gaining these skills, national partners are better able to contribute at the frontlines of the shared research-for-development agenda. Announcements of these courses are sent to national institutions well in advance, allowing them ample time to seek support for their participation. ICRISAT’s Learning Systems Unit (LSU) facilitates the attachment of scholars, partners and students in various Research Programs and projects in all the locations and laboratories. LSU facilitates scholarly studies and joint project attachments. The AgED Open Courseware Platform offers a research-infused curriculum targeting students, faculty members, extension agents, smallholder farmers, etc. through open educational resources – anywhere and anytime – in a cost effective manner. Currently, it has 7 ICRISAT courses, 11 Food and Agriculture (FAO) short courses, 1 Self-Employed Women’s Association (SEWA), India learning module, and more than 6300 learner-participants from around 160 countries. Two conference rooms and a small library. It also hosts collaborative partners such as the Alliance for a Green Revolution in Africa (AGRA), The World Vegetable Center, World Agroforestry Centre (I CRAF), and International Livestock Research Institute (ILRI) which conduct their respective research activities. – A library is directly connected to the ICRISAT headquarters library in India, thus linking it to major professional databases (an electronic library is also available). 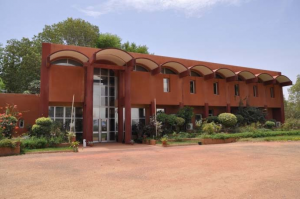 A separate Training and Visitors Centre (TVC), a self-contained modern training/housing facility, is located approximately 5 km from the city center on the Burkina Faso road. ICRISAT Nigeria is located in Kano, Nigeria. Approximately 16 hectares of farm land were acquired within the premises of Bayero University Kano (BUK) for research purposes. Currently, ICRISAT staff members are housed in temporary offices provided by the Institute for Agricultural Research (IAR) in Kano. A request has been made for office and laboratory space within the IAR premises in Kano, and the Federal Government of Nigeria will hopefully provide support for the construction. ICRISAT Kenya in Nairobi is the regional hub for Eastern and Southern Africa (ESA) with its office located at the World Agroforestry Centre (ICRAF) campus. Its Kiboko research station has a farm area of 11 hectares. There is a plan to request the Government of Kenya to allocate another14 hectares in addition to the existing farmland. The genomics laboratory is hosted by the World Agroforestry Centre (ICRAF)’s Genetic Resources Unit (GRU) and is therefore shared between ICRISAT and ICRAF. The facility has the capacity to support major molecular breeding activities right from DNA extraction to whole genome sequencing. The lab is divided into three units, each of which is specific for handling particular stages along the molecular analysis process. The first section handles the extraction of nucleic acids (DNA and RNA), both at low- and high-throughput scale. The second unit is set aside for Polymerase Chain Reactions (PCRs) and has a total of seven PCR machines, two of which can handle 768 reactions at a time, and another two for quantitative PCR. The last and most advanced section is the newly established state-of-the-art sequencing lab under the African Orphan Crops Consortium (AOCC: http://www.mars.com/global/african-orphan-crops.aspx). The AOCC’s goal is to rapidly generate whole genome sequences of 100 under-utilized nutritious crops of Africa, and finger millet, one of ICRISAT’s mandate crops, is already benefiting from the effort. 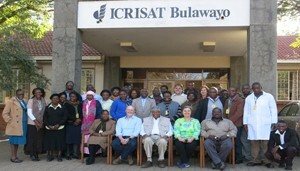 ICRISAT Zimbabwe in Bulawayo is located at the Matopos Research Station with 50 hectares of land, with 2 hectares in use. The Lucydale Research Station is 20 km from Matopos and has 16.24 hectares of land, with 7 hectares in use. 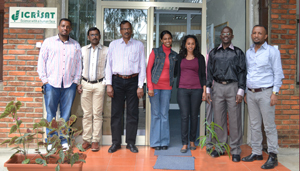 The ICRISAT Ethiopia country office was established in 2013, and is situated at the International Livestock Research Institute (ILRI) campus. The office has access to meeting rooms, houses and hostel facilities available on the campus. Some research technicians are based at the Ethiopian Institute of Agricultural Research (EIAR) stations at Debre Zeit and Melkassa. The Debre Zeit research station is the main center for chickpea improvement research and Melkassa is the hub for sorghum improvement work. The location is adequately equipped with required vehicles and other equipment for field research.